SIGNATURE: "Watch me pull a rabbit out of this hat." CAREER HIGH: THE BULLWINKLE SHOW (1961), a prime time show that also sparked massive media attention on the moose and squirrel. Rocket J. Squirrel was an All-American Boy Scout hero. Bullwinkle J. Moose was a "smart goof." Together this odd couple of animation won the hearts of millions. Even though their actual screen career was quite brief, they have become a fixture in the media consciousness of numerous generations. Rocky shared a simple house in Frostbite Falls, Minnesota, with Bullwinkle. It was never clear whether he owned the house, although he never seemed to worry about paying the rent. In fact, Rocky didn't have a job. It was probably just as well because he was constantly globe trotting to save mankind from a variety of disasters. Rocky was much smarter than Bullwinkle but in some ways, much more naive. Each time recurring bad guy Boris Badenov would appear in a hokey disguise, Rocky would usually state the character looked awfully familiar, but go along with the deceit. Although he was cautious, he believed in the goodness of people and never denied anyone who needed help. His friendship with Bullwinkle was unquestioned. Even though he usually knew better, he frequently went along with Bullwinkle. No matter how odd Bullwinkle acted, Rocky stood by him. Bullwinkle J. Moose was a tall brown moose with antlers who sometimes wore clothes and sometimes didn't. It took Bullwinkle a lot of effort to think but that never stopped him. Unlike Rocky, he could get angry, but he never used his physical strength to intimidate anyone. Like Rocky, Bullwinkle never had a job. He was certainly a lucky moose, frequently avoiding fantastic death traps and injuries though stupidity. He had an eye for the ladies and could fall in love at the drop of a handkerchief. Bullwinkle often thought he was smarter than he actually was which led to trouble. His strong friendship for Rocky sometimes propelled him into action to save his little buddy. Bullwinkle was incredibly stubborn and once he had made up his mind would refuse to change it. Jay Ward and Alex Anderson had become friends while attending the University of California at Berkeley. After college, Anderson worked for a brief time with his uncle, Paul Terry, who owned the Terrytoons animation studio. Ward went to Harvard and got a Masters Degree in Business. He returned to Berkeley to open a real estate office. On his first day of business, a runaway truck crashed into the office, breaking both of Ward's legs. Anderson visited Ward in the hospital and talked to him about his idea of producing a low budget animated series for TV. Ward was intrigued and became Anderson's partner in the new company, Televisions Arts Productions, Inc (TAP). In 1948, TAP presented three proposals to NBC: Crusader Rabbit, Dudley DoRight and Hamhock Jones (a private eye whose enemy was a Siamese twin). NBC rejected two of the proposals but approved Crusader Rabbit. Working together in a makeshift studio set up in Anderson's mother's garage in Berkeley, the two men produced what many historians consider the first limited animation series made for TV. It was done in serial format. There were five four-minute cliffhanging installments for each story so that it could be strung out over an entire week or stripped together for one episode. Crusader Rabbit lived in Galahad Glen with his friend, Ragland ("Rags") T. Tiger. Crusader was a small but quick-witted and aggressive hero. Rags looked ferocious but was actually the more passive and dumb of the duo. To compensate for the limited animation, Ward and Anderson emphasized clever writing. When Crusader asks Rags to whistle a chorus of the song "Dixie," the tiger hesitated and responded, "Is it in public domain?" Villains included Dudley Nightshade, Babyface Baracuda, Achilles the Heel and a two headed dragon named Arson and Sterno. The series started production in 1949 but because of difficulty in selling the show, it didn't officially premiere until August 1, 1950, almost a year after advertisements promoting it appeared in trade magazines. Ward and Anderson moved the studio to Los Angeles but production on the series stopped in 1950 because of a lawsuit concerning the ownership of the show. To avoid further legal battles, Anderson and Ward sold their company but were able to retain the rights to other characters and pilots that the company had been developing. One of those projects was THE FROSTBITE FALLS REVIEW. It was about a group of anthropomorphic animals running a television station in the North Woods. Among the characters were Oski Bear (the cameraman), Blackstone Crow (a fiery director), Sylvester Fox (an egotistical actor), and Flora Fauna (Fox's leading lady). There were also two other characters: Rocky, the flying squirrel, and Bullwinkle, the "French-Canadian moose." (Bullwinkle had been named after a local used car dealer because Ward thought the name was funny.) The proposal for the show was to parody TV programs. After the selling of TAP, Anderson went into advertising and Ward returned to real estate. Creston Studios, under Shull Bonsall, produced a new color series of Crusader Rabbit adventures in 1957-58. In 1958, Ward decided to return to animation but Anderson was too busy with a successful advertising career. So, Ward joined with Bill Scott, a prominent animation storyman who had worked at Warners, UPA and with Bob Clampett. Their first project was ROCKY AND HIS FRIENDS, using two of the characters created for THE FROSTBITE FALLS REVIEW. Reportedly, Anderson was a consultant to Scott at the start of the series but soon dropped out of the picture. June Foray was a talented voice artist who had supplied voices for animated cartoons at Warners and Disney. Ward had used a female voice (Lucille Bliss) for Crusader Rabbit and felt that Foray might provide a similar boyish voice for Rocky. Over a lunch of drinks, Ward was finally able to get Foray to commit to doing a flying squirrel. Bill Scott unexpectedly found himself cast as Bullwinkle. He had been reading the lines for the moose during rehearsals. One day he asked Ward who was going to be hired to do the voice for the pilot. Ward replied he always thought Scott was going to do it because he seemed to understand the character so well. The rest of the voice cast included famous voice actor Paul Frees as the villain Boris Badenov and William Conrad, well known radio and TV performer, as the narrator. Foray did double duty as Natasha, the female companion to Boris. ROCKY AND HIS FRIENDS was similar in format and style to CRUSADER RABBIT. The series was about a diminutive but sharp hero and his large, bumbling companion. Rocky and Bullwinkle lived in Frostbite Falls, Minnesota but that didn't prevent them from having adventures all over the world. Complications usually came from two villains from Pottsylvania, Boris Badenov and Natasha Fatale. The rest of the half hour was filled with segments like "Fractured Fairy Tales" which were twisted versions of famous fairy tales narrated by Edward Everett Horton. For instance, Aladdin didn't have a magic lamp but a magic lump on his head that granted wishes. The prince didn't wake Sleeping Beauty but built a theme park around her. An even more popular segment was "Peabody's Improbable History." Mr. Peabody, a highly intelligent dog who walked upright, had a pet boy, Sherman. In order to help Sherman understand history better, Mr. Peabody built a time machine called the "Wayback Machine." Each episode the pair would journey back in time to find out the real story behind a historical event. Usually, it depended upon Mr. Peabody to come up with the proper guidance to help these events occur. Another segment that often appeared was "Aesop and Son." The famous philosopher would tell his son a fable. At the end of the story, Aesop provided a moral while his son offered a punnish moral as well. Occasionally there was a short segment entitled "Mr. Know It All." Bullwinkle would be the expert who gave foolish advice. Another short segment was "Bullwinkle's Corner" where Bullwinkle attempted to read famous poems but with a Jay Ward twist. 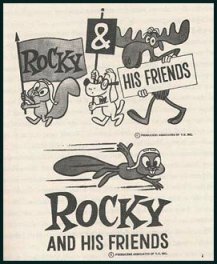 ROCKY AND HIS FRIENDS premiered November 19, 1959 and the that first season on ABC had two storylines for the moose and squirrel. The first story lasted 40 episodes and is generally known as "Jet Fuel Formula." Rocky and Bullwinkle use Grandma Moose's cake recipe and accidentally discover a rocket fuel powerful enough to propel a stove to the moon. The secret ingredient is mooseberries and the government wants Bullwinkle to duplicate the formula. Trying to prevent this from happening are Boris and Natasha as well as two moon men, Gidney and Cloyd, who have a "scrooch" gun and don't want tourists on the moon. The second story that first season was "Box Top Robbery" which only lasted a dozen installments. The global economy is threatened by counterfeit cereal box tops. It was a satirical jab at General Mills and its cereals who were sponsoring the show. ROCKY AND HIS FRIENDS was one of the first examples of "runaway animation." This is a term used to describe an American animated series where the majority of the work is done outside the country, usually to save money. "In an effort to reduce costs, the advertising agency that had the General Mills account invested in an animation studio in Mexico," recalled director Bill Hurtz. "Then they made a contract with Jay which agreed that we'd write the stories, direct them, design them, and assemble them, but that the animation was the backgrounds and inks would be done in Mexico... This was nothing that Jay was particularly fond of." Even though some of the Ward staff, including Hurtz, were periodically sent down to Mexico for quality control, problems arose. "We found out very quickly that we could not depend on Mexican studios to produce anything of quality," remembered Bill Scott. "They were turning out the work very quickly and there were all kinds of mistakes and flaws and boo-boos... They would never check... Moustaches popped on and off Boris, Bullwinkle's antlers would change, colors would change, costumes would disappear... By the time we finally saw it, it was on the air. It went directly from Mexico to airing... As a result, we tried to pull as much of the work as possible up North." Reportedly, at one point to avoid customs problems, people would bring some of the completed episodes back across the border in their suitcases as home movies. That first season, 26 shows were produced. The next season 52 shows were produced. Those adventures included Bullwinkle inheriting a mine full of "upsidaisium," the anti-gravity metal. Also remembered from that season were the terrifying metal munching mice from the Moon who under the direction of Boris were eating TV antennas; the bad TV reception was throwing the nation into chaos. With the success of THE FLINTSTONES in prime time, networks were looking for similar shows that could appeal to both adults and children. ROCKY AND HIS FRIENDS, because of its humor, had become a cult favorite. NBC decided to take a chance and transfer the show to prime time. The show was retitled THE BULLWINKLE SHOW since the Moose had captured the hearts of America (and so as not to confuse it with ABC's ROCKY AND HIS FRIENDS). The show premiered Sunday, September 24, 1961 on NBC at 7:00pm. In the beginning, the programs were introduced by a Bullwinkle puppet voiced by Bill Scott. The puppet was just the head and neck and looked like it was made out a soft, fuzzy terrycloth material. One time it suggested to the kids in the audience to pull the knobs off their TV sets. "In that way, we'll be sure to be with you next week," reasoned Bullwinkle. "NBC was furious," Ward stated. "Seems about 20,000 kids **did** pull the knobs off their sets. Well we fixed it. We had Bullwinkle come on and say, "Remember, kids, a couple of weeks ago we asked you to pull the knobs off your sets? Well, you can put them back on now. Use glue - make it stick.'" While for the most part the puppet said less outrageous things like "What other show has a host with antlers? On this network, anyway." NBC requested that the puppet be removed and it became just a vague memory for those people fortunate enough to see those first run programs. THE BULLWINKLE SHOW was similar in format to ROCKY AND HIS FRIENDS. There were two cliffhanging installments of the adventures of Rocky and Bullwinkle. These episodes included "Missouri Mish Mash" which was the story of the Kirward Derby which made its wearer the smartest man in the world. When asked if the famous hat was named after Durwood Kirby, a comedian on THE GARRY MOORE SHOW, Ward replied, "Of course not. But what else would you name a derby? They've already used 'Kentucky.'" The explanation did not prevent the comedian from expressing his dissatisfaction with the situation. Other memorable series include the "Goof Gas Attack" with the Pottsylvanian secret weapon that caused stupidity but had no effect on Bullwinkle. "Wossamotta U." ("What's-a-matter-you") had Bullwinkle become a football star at Wossamotta University and had to face the Mud City Manglers, vicious crooks disguised as an all girl football team. During the three seasons on NBC, THE BULLWINKLE SHOW introduced the swampy little island of Moosylvania which Ward would use in a big publicity push later. The rest of the show was filled with some of the same additional segments that appeared on ROCKY AND HIS FRIENDS. One new segment was "Dudley Do-Right of the Mounties." Based on the pilot concept developed earlier by Ward and Anderson, Dudley inherited a hyphen for his last name. Dudley was a member of the Royal Canadian Mounted Police but while his heart was in the right place, he was a bit thick headed. His arch enemy was Snidely Whiplash, a classic melodrama villain with black cape and stovepipe hat. It was a satire of the old Nelson Eddy movies. To help this new prime time show to succeed and just for the fun of it, Ward staged many Bullwinkle publicity stunts. In 1961, he roped off a section on Sunset Boulevard where his studio was located. He hired an 18-piece "Bullwinkle Philharmonic" orchestra to play and issued 500 invitations. He had Jayne Mansfield unveil a 14-foot revolving statue of Bullwinkle Moose. Actually 5,000 people showed up! "It had all the elements of a riot," Ward observed. Ward offered substantial cash to anyone who would go over Niagara Falls in a Bullwinkle costume or who would smash into Lenin's Tomb in a 1938 Hudson Terraplane, marked "The Bullwinkle Special." He had beautiful girls dressed in Salvation Army uniforms parade down Madison Avenue carrying signs reading: "Repent! Watch THE BULLWINKLE SHOW!" Ward also owned The Bullwinkle Stables which at one time housed 27 of his race horses. Ward's jockeys wore yellow and orange silks, with Bullwinkle's head on the back. The most amazing Bullwinkle related stunt was the "Statehood for Moosylvania" campaign. Ward purchased a small obscure island in the Minnesota lake region and dubbed it "Moosylvania" like its cartoon counterpart. Then he had a van converted into a circus wagon with a calliope and a "Wossamatto U." logo. Ward dressed up in an Admiral Nelson outfit and his publicist, Howard Brandy, dressed as Dudley Do-Right. They traveled the country and got 50,000 legitimate signatures on their petition for statehood. The stunt climaxed with Ward driving the van, calliope blaring onto the White House lawn. He arrived just as news of the Cuban Missile Crisis was breaking and armed guards escorted him off the White House premises. At the time, NBC vice president Sydney Eiges told the press, "I thought the whole thing was in bad taste." NBC press representatives somehow mysteriously failed to show at certain Bullwinkle functions even after being reminded by the ad agency handling the General Mills account. In fact, though the agency and the sponsor had originally contracted for THE BULLWINKLE SHOW to be show at 6:30 pm EST, the network pushed it back to 7:00 where it had to battle the popular LASSIE. When renewal time came up, the sponsor began talks with CBS but NBC reluctantly agreed to an earlier and cheaper time slot at 5:30pm. However, when the time switch was made, NBC announced that ENSIGN O'TOOLE would fill THE BULLWINKLE SHOW time slot but made no mention of the new time for BULLWINKLE. This action led many to believe that BULLWINKLE was canceled and in fact one newspaper quoted "network sources" that BULLWINKLE "definitely will not return next fall." Later, NBC denied it had made such a statement. Ward countered by issuing the following announcement: "It is with great ennui and profound personal apathy that the National Broadcasting Company announces the renewal of THE BULLWINKLE SHOW for the 1962-63 TV season. THE BULLWINKLE SHOW will air at 5:30pm on Sundays, a time slot once occupied by OMNIBUS. Oh, well, it's in color." These were new episodes. THE BULLWINKLE SHOW lasted until September 1963 on NBC Sunday night and moved to Saturday morning for one season. ABC picked up the reruns and presented them on Sunday from 1964-1973. While Ward and Scott went on to other projects like THE GEORGE OF THE JUNGLE SHOW, they still retained an affection for the Moose and Squirrel. Bullwinkle, who had become the spokesmoose for Cheerios cereal, would appear in animated commercials and print ads for many years. "We toyed with the idea of other projects for Bullwinkle," remembered Scott. "We had a Bullwinkle's Valentine Day special planned. A couple of things like that." The project that got the farthest along was THE STUPORBOWL, a parody of the Superbowl football game. "We went ahead and did the pilot, shot straight storyboards. Animatics, I guess it's called. We heard that the network was pretty high on it until they checked with the NFL and found out they didn't think it was so funny." Supposedly, the project was rejected because the storyline had Boris attempting to fix the outcome of the game and the show harshly parodied actual team owners like Georgia Frontiere. In the Seventies, Clem Williams Films, Inc., packaged a 90 minute compilation show for the college circuit. Entitled AN EVENING WITH BULLWINKLE AND HIS FRIENDS (aka THE JAY WARD CARTOON FESTIVAL), it had the complete "Wossamotta U" story as well as other Ward cartoon segments like Dudley Do-Right. At one time it was announced former Warner's director Friz Freleng had acquired the rights to Rocky and Bullwinkle and was going to produce a new series. 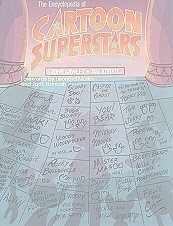 "Jay had said he might be interested in having Friz produce the cartoons if we could write the stuff and keep the creative control. But that's as far as it went. It never got to rights. It never got into any commitment," stated Bill Scott. The last appearance so far of Rocky and Bullwinkle was a commercial for Hershey's kisses. Bullwinkle attempts to perform his famous hat trick and pulls out a bag of the chocolates. In 1986, the New York Museum of Broadcasting paid tribute to Ward and his crew with a festival that ran for several months. That same year saw the founding of THE FROSTBITE FALLS Far-Flung Flier, a newsletter dedicated to the thousand of Ward fans around the world. In 1987, a tribute, entitled "Rocky and Bullwinkle and Friends: A Tribute to Jay Ward," was presented at the Los Angeles Museum of Broadcasting. In 1988 Walt Disney Home Video purchased the video rights of the entire Rocky and Bullwinkle library for around $1 million. Also in the package were the other elements of the show including "Fractured Fairy Tales," "Mr. Peabody," etc. Disney Home Video were planning on beginning releasing tapes featuring the stars sometime in the 1990s. With the death of Bill Scott in 1985 and Jay Ward in 1989, the rights to the characters may go to other hands. That may mean new adventures of Rocky and Bullwinkle sometime in the future. Boris Badenov was a spy from Pottsylvania. He was short and dressed completely in black, including his hat. He had a white complexion with a thin black mustache. In the early episodes his pupils were blood red but they eventually evolved into white. His heavy Slavic accent could have easily been Russian. He was an unrepentant comic villain. His superior was Fearless Leader, a scarfaced, monocled nasty fellow who resembled a World War II Nazi officer. Badenov was completely inept when it came to dealing with the Moose and Squirrel. He often donned a series of disguises that totally fooled Rocky and Bullwinkle. Yet he was still unable to win no matter what dirty tricks he tried. Boris really enjoyed being a villain and admired nasty attitudes in others. Captain Peter "Wrong Way" Peachfuzz was based on Peter Piech, the executive producer. Both Bill Scott and Paul Frees at different times provided the voice for the character which was an imitation of Ed Wynn. A Navy man who was continually confused, Peachfuzz was involved in government business and usually got Rocky and Bullwinkle involved. Gidney and Cloyd were two Moon men who often journeyed to Earth. Physically, they were similar to the Ward commercial character, Quisp. Of all of the Ward characters, Rocky and Bullwinkle were the ones who were most merchandised. They appeared on the usual items from Soaky (bubble bath) bottles to coloring books to bendable figures. Some Rocky and Bullwinkle items were released as cereal premiums in the Sixties as a result of their close association to General Mills and, in particular, Cheerios. Al Kilgore was responsible for writing and drawing a short lived and little seen comic strip (1962-64) that captured the spirit of the show and was greatly admired. There were several ROCKY AND HIS FRIENDS comic books published by Dell and Gold Key. There were numerous issues of a BULLWINKLE comic book published at various times by Dell, Gold Key and Charlton. Star (Marvel) began a series of BULLWINKLE comics in 1987 that was discontinued in 1989. Blackthorne Publishing even issued a BULLWINKLE AND ROCKY comic book in 3-D. In 1983 a series of Bullwinkle Family Restaurants opened where customers could watch audio-animatronic versions of Rocky, Bullwinkle and other Ward characters while they ate. These shows were written by Scott and featured the actual voices of Scott and Foray. There were such food items as Bullwinkle's Famoose Pizza and Rocky's Remarkable Burgers. Desserts included Rocky's Road, Frostbite Falls and Bullwinkle's Mousse. The gift shop had a wide range of Bullwinkle merchandise not available elsewhere. There was a large game room and a booth where people could get their pictures taken with the characters. Most of the locations had closed by the end of the Eighties. Jay Ward, himself, opened one of the first cartoon character merchandise stores in 1971. Called The Dudley Do-Right Emporium, it was located right next door to Ward's studio and was often run by his wife. It carried an array of souvenirs like watches and sweatshirts and cels and more which all featured Ward's characters. Though this team only worked for a few years, their impact on the animation industry and generations of viewers is enormous. Dozens of catch phrases, from "Bullwinkle is a dope," to "All on this itty-bitty card," to "Fan mail from some flounder" are still used today. The free-wheeling humor of the Jay Ward studio is a marker from which many modern cartoonists are measured. Many cartoon characters still being produced and promoted today are less visible in our society than this mighty Moose and Squirrel. Like Marilyn Monroe, James Dean and other cult stars, Rocky and Bullwinkle's career ended far too early... but their legacy of films and laughs will last forever.